Lovely pretty customisable Hen Party Button Badge. This white 1-inch hen party badge has the classic Hen Do text and you can personalise it with the name of the Bride to Be. 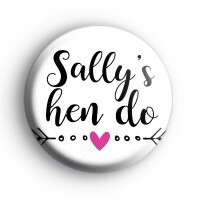 It is a really cute badge for everyone to wear on your Hen Party, to let everyone know that you're out with your friends for a wild night (last night of FREEDOM). Girls ONLY! We have a huge selection of Bride, Groom and Wedding themed badges in the shop so be sure to take a look at those before you check out.